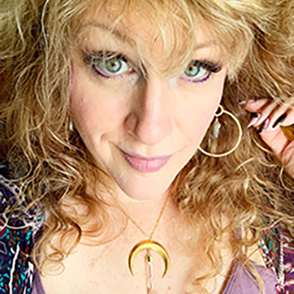 Sandra Mariah Wright is a prominent Salem Witch and a dedicated High Priestess of the Alexandrian Tradition of Witchcraft who uses her magic and psychic insight to offer the guidance and wisdom of the old ways of Witchcraft to those around her. She created "Death and Rebirth: Ritual Transformation" for Salem's annual Festival of the Dead. Sandra is also a Bard, and has raised her powerful voice to honor the ancient Gods and Goddesses and to sing her magic into being. She has appeared on The Travel Channel, Showtime, and Dish Network, and has been featured in The Boston Globe, North Shore Sunday, and The Salem News. Her family's estate stands on Gallows Hill in Salem, where 19 people were hanged for the charge of Witchcraft. The voices of the accused called to Sandra, who discovered her talent for magic in her early teens. She and her husband Kevin run Elphame, a British Traditional training coven, and its outer court group, Gallows Hill Grove. Her handmade charms and talismans are available at Hex and Omen under the name of her company, Gallows Hill Witchery; she will also be offering jewelry, palm stones, and other treasures in the vending area throughout Hexfest. Sandra Mariah Wright has a table in our Vending Area!